The season is spookiness is here! But more than the spookiness, Halloween in the Philippines is more like a parent-child, and cherished family bonding time. 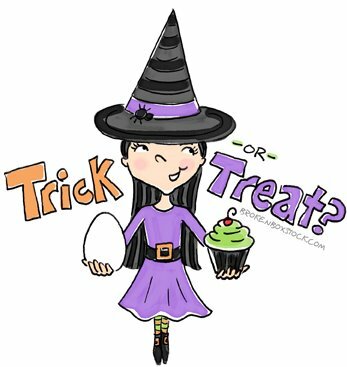 So, to guide you, I've rounded up some fun, and not-so-scary Halloween activities and events around the Metro. 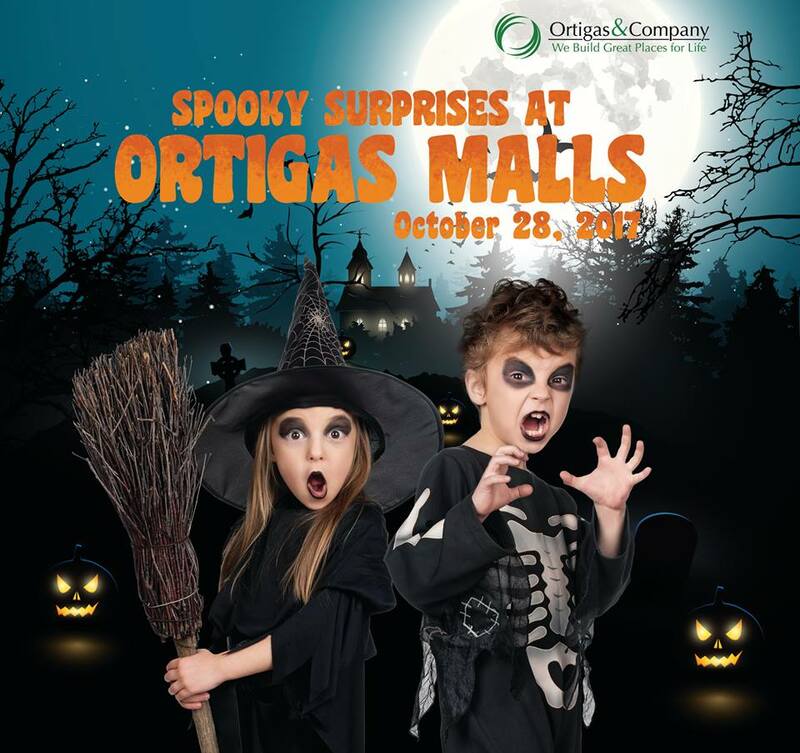 Celebrate a Spooktacular Halloween at SM Malls with the whole family. Just wear outfits that are both scary-fic and comfy. 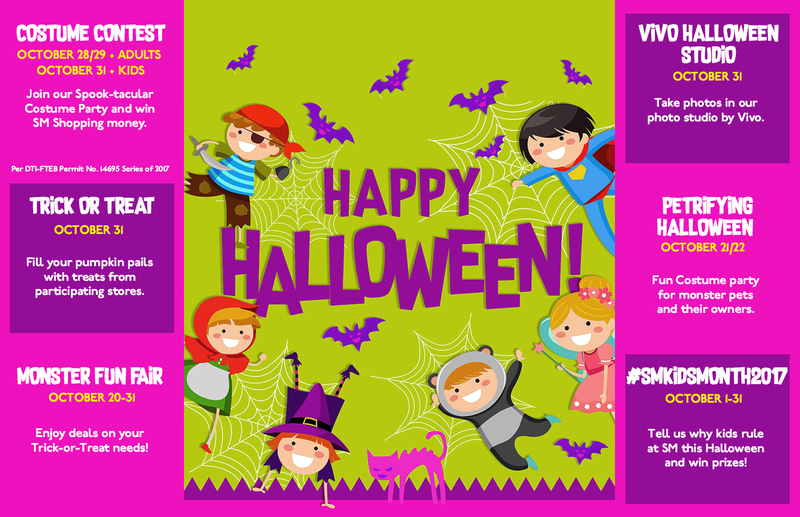 Make sure to join the nationwide SM Halloween celebration by checking the schedules of your favorite SM Malls 👉 HERE. 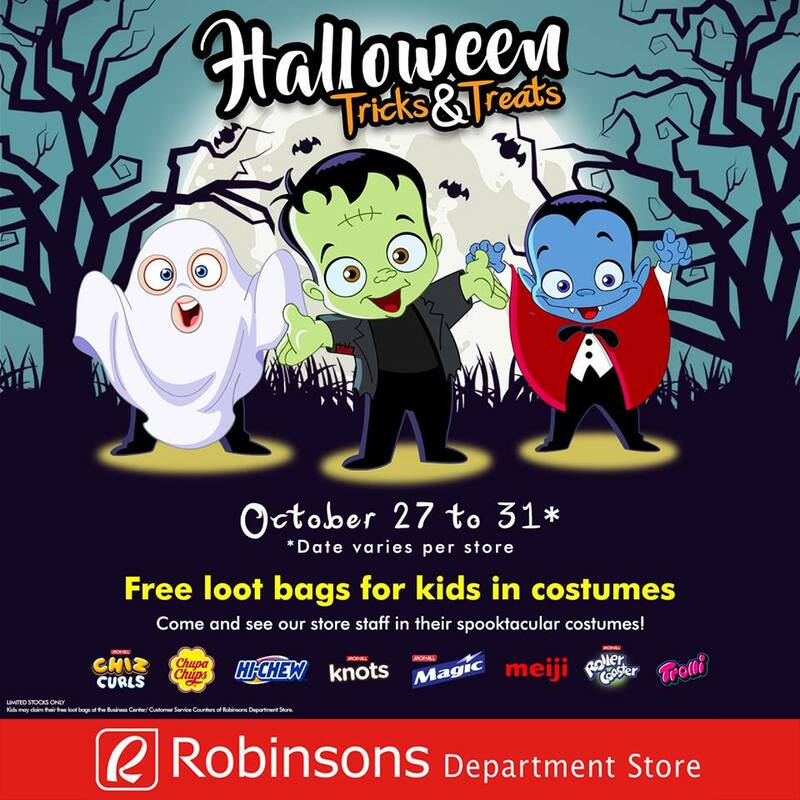 Celebrate Halloween 🎃 at your favorite Robinsons Malls! 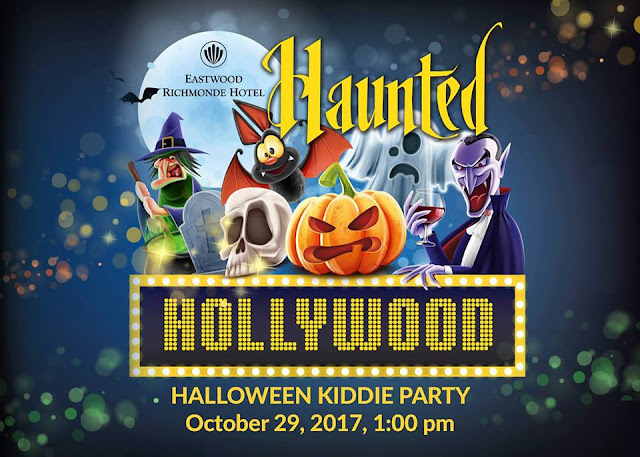 Join the Trick or Treat Parade, Magic Shows, Photobooths, and lots of games and prizes starting October 28, Saturday. 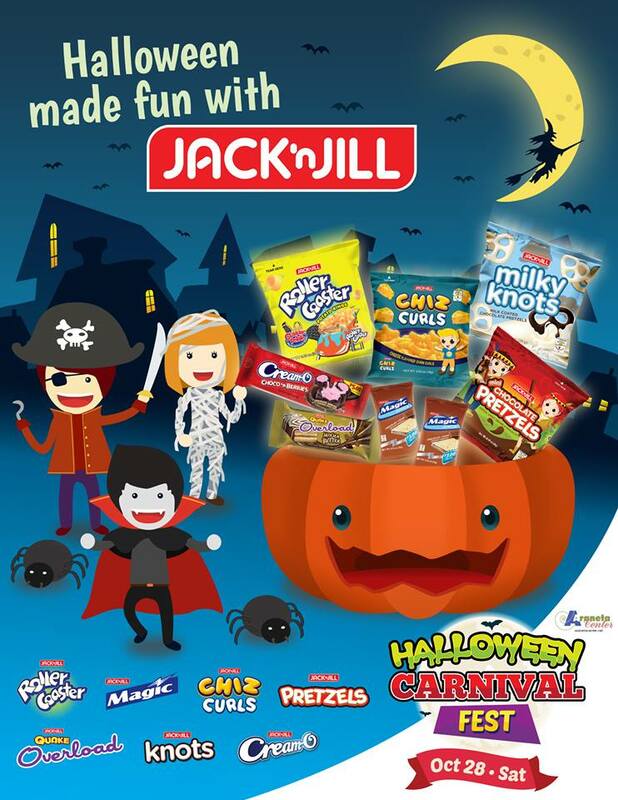 Check HERE to know more about the Halloween activities in your favorite Robinsons Malls. · Customers must present their receipts at the registration booths located at the activity areas of Ali Mall, Farmers Plaza, and Gateway Mall on October 28, 2017 from 11:00AM-2:00PM only. · Strictly one transaction per receipt only. For receipts worth P2,100 and up, only a maximum of three entrance passes shall be given. For more info, please call The Araneta Center at (02) 911-3101. 1. Interested participants may register from October 23-28, 2017 during Mall Operating Hours, and on October 29, 2017 from 11:00 AM to 3:00 PM only. 2. To register, participants may go to the Fisher Mall Admin Office (4th Floor) or the Fisher Mall Concierge (Upper Basement Level) to get their application forms from October 23-28, 2017. For registration on October 29, 2017, participants may proceed directly to the Registration Booth at the Ahoy, Me Mateys! Kiddie Fair Main Event Area beside The Galley Food Hall (3rd Floor). 3. To be given an application form, registrants need to present P1,000 single or accumulated receipts for purchases from any Fisher Mall tenant/s made within the Registration Period (October 23-29, 2017). 5. 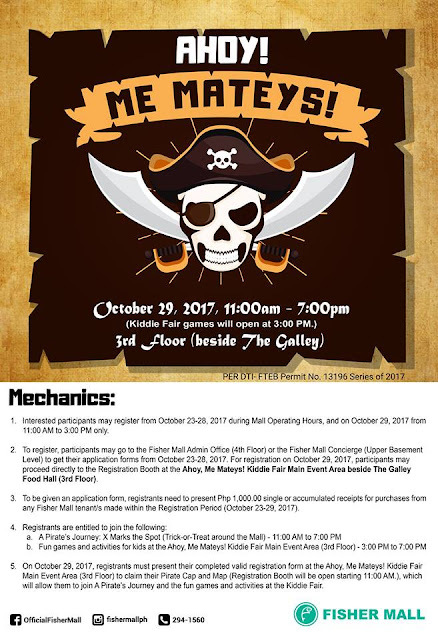 On October 29, 2017, registrants must present their completed valid registration form at the Ahoy, Me Mateys! Kiddie Fair Main Event Area (3rd Floor) to claim their Pirate Cap and Map (Registration Booth will be open starting 11:00 AM. ), which will allow them to join A Pirate’s Journey and the fun games and activities at the Kiddie Fair. 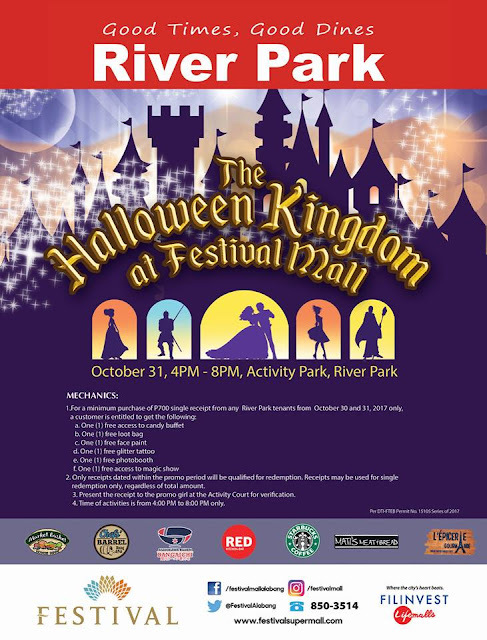 Festival Mall in Alabang has a HALLOWEEN KINGDOM at Activity Court, River Park on October 31, 2017 from 4pm to 8pm. 2. Only receipts dated within the promo period will be qualified for redemption.Receipts may be used for single redemption only, regardless of total amount. 3. Present the receipt to the promo girl at the Activity Court for verification. Spooky Surprises at Ortigas Malls (below) if you dare for some Halloween scare on October 28! Shop at Greenhills, Tiendesitas, and Estancia from October 13 to 28 to get one (1) free pass to a fun Halloween celebration for a minimum accumulated receipt purchase of P3000. Activities include magic and illusion, dancing balloon show, face painting, acrobat exhibition, fun food booths, and more. For a fun ride in Circulo Verde's Bike Playground, simply get an all-access pass for P200 per person. There's no party like a Halloween Galactic Party at Ayala Malls. Make Halloween cosmic on October 29-31 and enjoy galactic treats, starry shows, stellar wars, space encounters, and more. Halloween is not all about scaring, it can also be a time for sharing to help others! Look for the funky boxes at any Toy Kingdom stores to donate and share your blessings to the children of UNICEF! 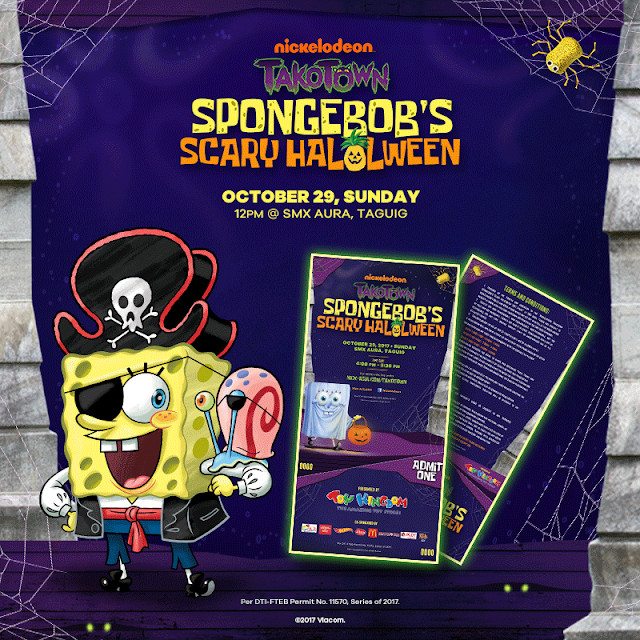 Toy Kingdom and Nickelodeon present Takotown: Scary HaLOLween at SMX Aura! For a minimum single receipt purchase of P1,000.00 of any toy, inclusive of Halloween items, at any of the participating branches of Toy Kingdom and Toy Kingdom Express, customers are entitled to get two (2) FREE tickets to Nickelodeon’s Takotown: Boo-Kini Bottom October 29, 2017 at 1:00pm and 4:00pm at SMX Aura. One (1) ticket is good for one (1) person – Adult or kid. Customers present proof of purchase at the redemption area of the any of the participating stores any day within the promo period, and get their free tickets, until October 29. On October 29, tickets may be redeemed at the SM Aura Toy Kingdom branch only. Promo period runs until Oct. 29, 2017, 12:00nn. 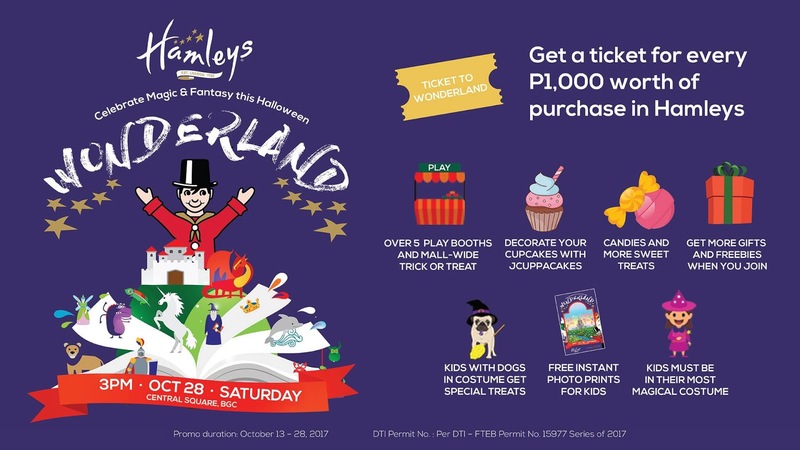 Celebrate a magic-filled Halloween with Hamleys in Central Square BGC on October 28 at 3PM! 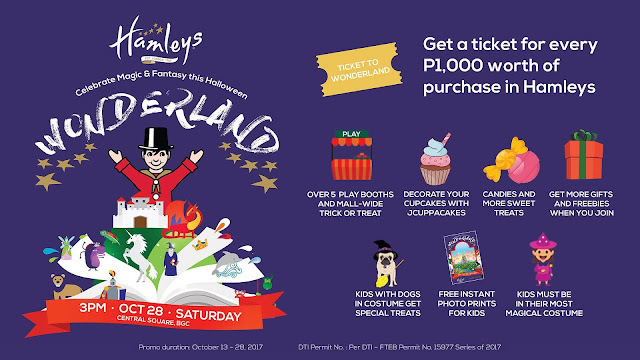 Get a ticket to the Wonderland with every P1,000 worth of single-receipt purchase at Hamleys until October 28. Enjoy more than 5 play booths, decorate your own cupcakes, and nibble on sweet treats! 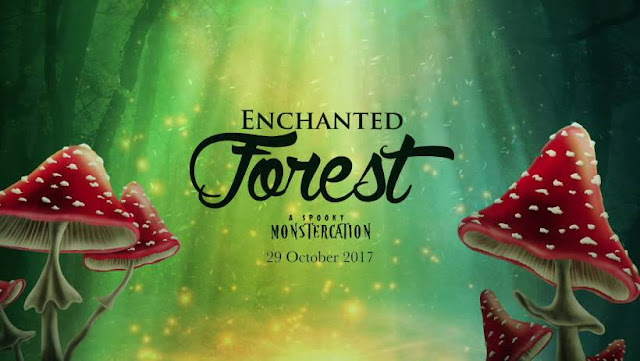 Join them in your most magical costume, plus get a special gift if you bring your pet pup in costume! 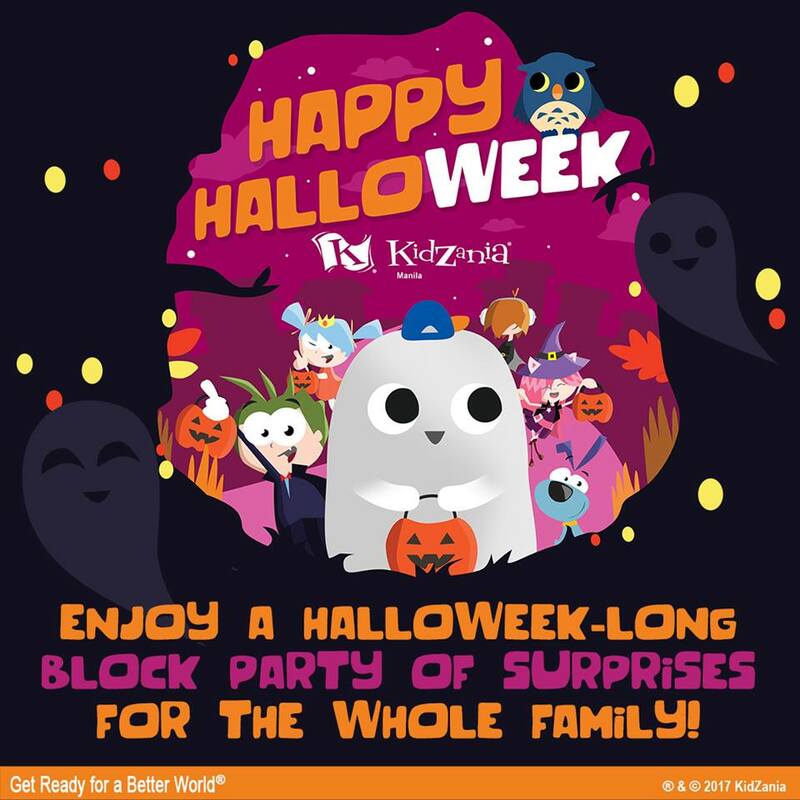 Come and experience KidZania Halloweek on October 28 to November 5, 2017. Get ready for a week-long block party of surprises for the whole family! PLUS exciting trick or treat challenges await you. They have fun activities for both kids and parents like the interactive Halloweek Alley Challenge. Plus, B*KidZanian CitiZens have exclusive access to the Tricky Trick or Treat experience! Check HERE for more details! 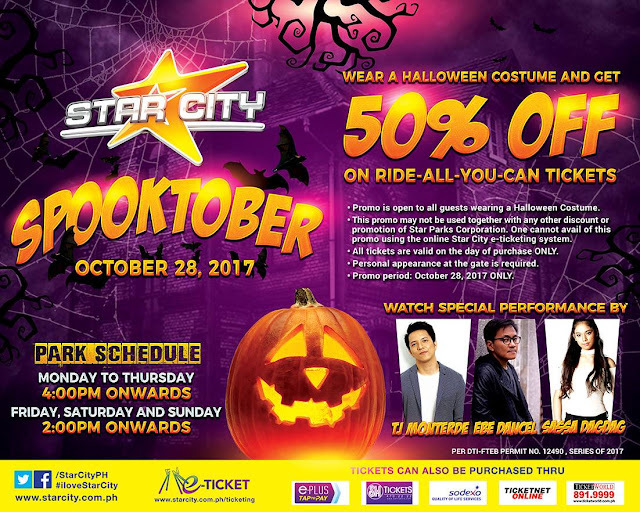 A Spooktober Halloween awaits you at Star City on October 28. Just wear a Halloween Costume and get 50% off on ride-all-you-can tickets. A Ghostbusters Halloween weEKend Special at Enchanted Kingdom happens on October 28-29, 2017. Kids (up to 12 years old) are invited. 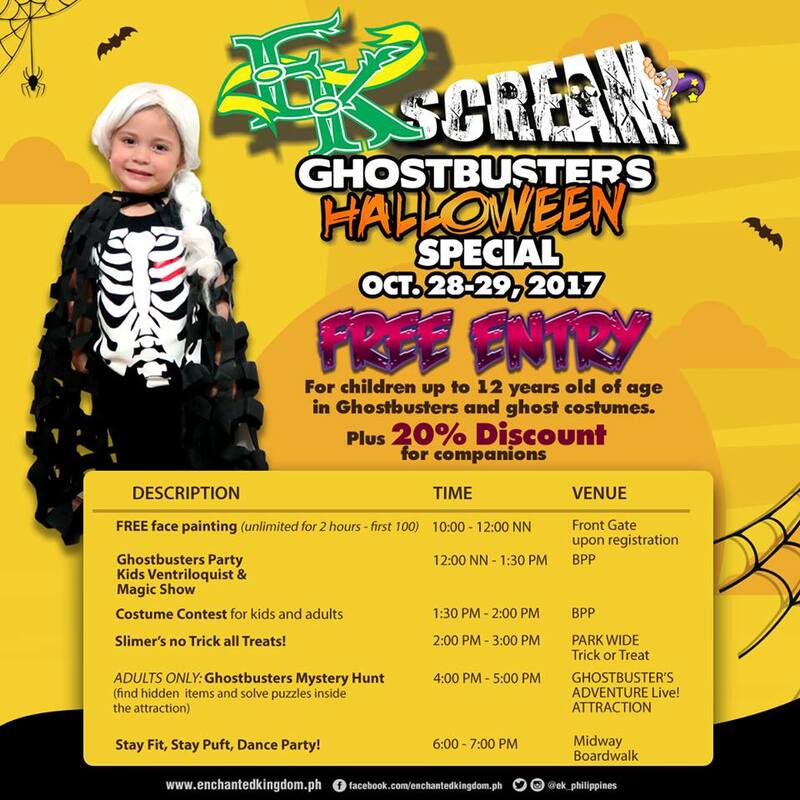 Just come in your most FUNtastic Ghostbusters/ghost costume and join for FREE this Halloween weEKend! Companions also get 20% off our published rates! Everyone is invited to this year’s Belleboo at Bellevue Hotel in Alabang -- the largest superhero gathering in the South! Dress as your favorite superhero (or create your own!) and GET A CHANCE TO WIN A 3 DAYS & 2 NIGHTS STAY AT THE BELLEVUE RESORT BOHOL! 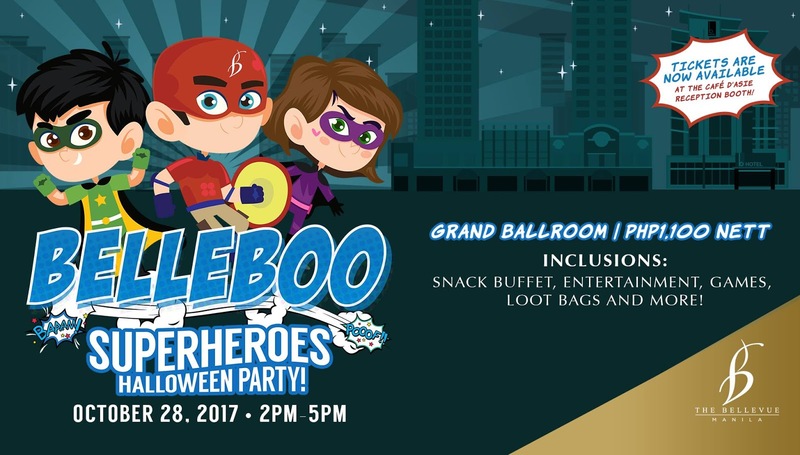 See you on October 28, 2:00 to 5:00 PM at The Bellevue Manila Grand Ballroom. Tickets are for sale at Cafe d'Asie for only P1,100 net! Dress up as your favorite superhero or villain such as Batman, Harley Quinn, Wonder Woman, Superman, Supergirl, Flash, Justice League, Catwoman, Batgirl, Joker, Green Lantern, Aquaman, Green Arrow, Robin, Poison Ivy, and other Comics Characters on October 28 at Crimson Hotel Filinvest City, Manila and SAVE THE DAY! 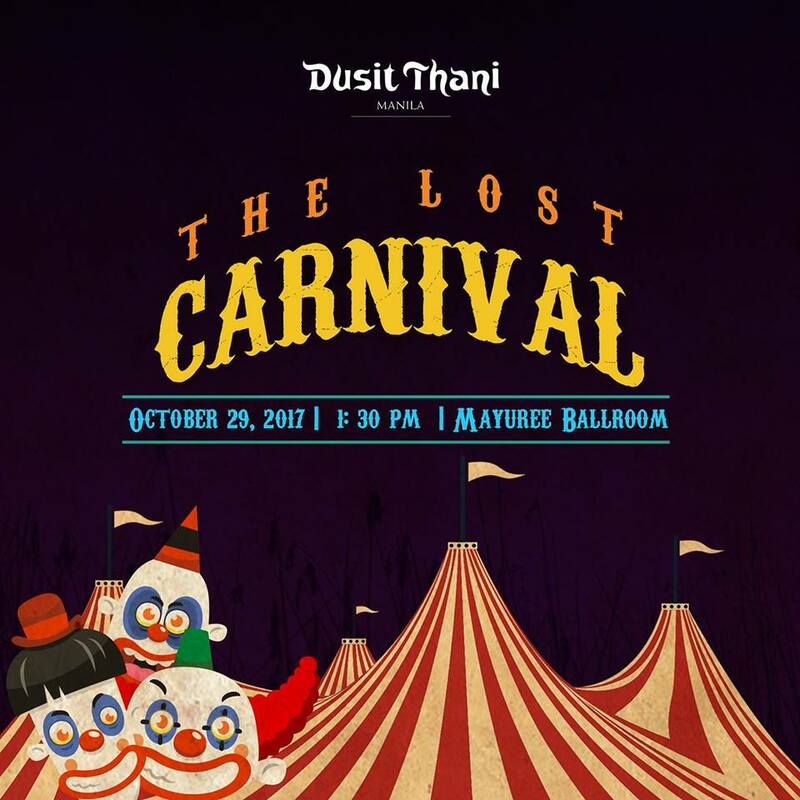 The Lost Carnival Halloween Event at Dusit Thani Hotel Manila happens on October 29, 2017 1:30PM at Mayuree Ballroom. Dare to enter this abandoned amusement park that has been out of touch with the world for many years. Old and rustic, feel the dreadfulness and creepiness of this lost carnival. The brave ones will witness and experience: The Acrobat Show, Ventriloquist Show, Best in Costume Contest, Carnival Activity Booths, Trick or Treat Activity, Kiddie Fashion Show by Osh Kosh B’ Gosh. For tickets, call Dusit's Restaurant Reservations at 238 8888 local 8439 & 8838. Experience movie-inspired fun frights this Halloween at Eastwood Richmonde Hotel! 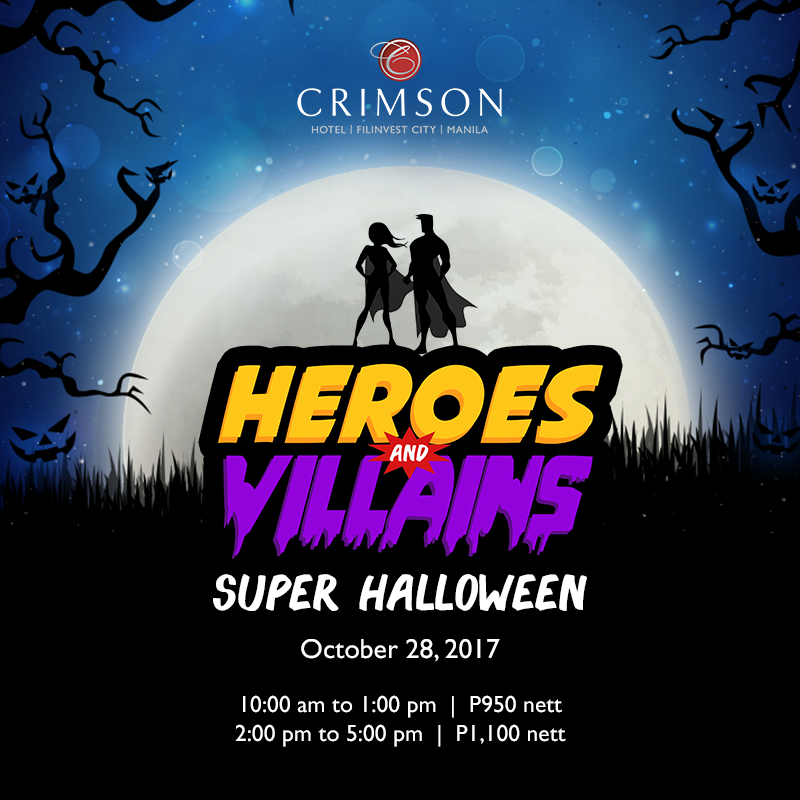 Get the entire family ready for some shocking delights -- merienda buffet, snack stations, magic show, games, haunted house, photo booth, costume contest for kids and parents, and many more! Ticket price: P850nett per child or adult. For inquiries, please call Eastwood Richmonde Hotel at (632) 570-7777. Wiching you a Happy Halloween!